This guy comes around most every day for a peanut. 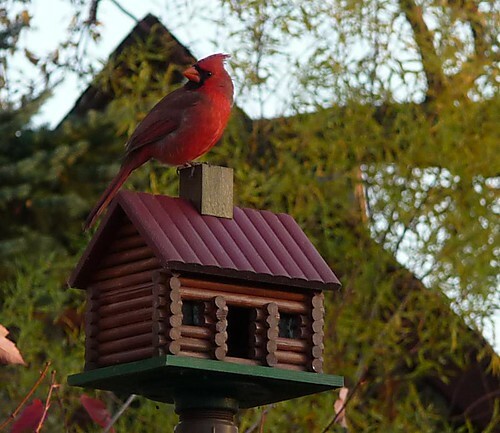 He waits in his usual spot atop the log cabin bird house. It's stiff competition between him and the squirrel. 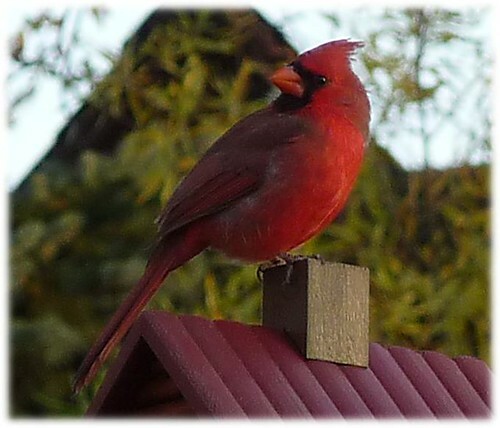 (9/9/11) I now have a video of the Cardinal coming to get his peanut! I haven't posted in a while any "good" stuff. I'm trying to catch up things before I finally return to work after a terribly long duration of dealing with a torn ACL. I promise to have a new video soon; because I have a Christmas stocking that needs to be finished and I've been saving it for the video on grafting with the kitchener stitch. Beautiful shot!!! These birds are simply beautiful!! I don't hardly see these beautiful birds in California....very rare!!! Gods amazing creations!! !